The Moon - a guide provided by www.spacekids.co.uk ! Earth's nearest neighbour - the Moon. 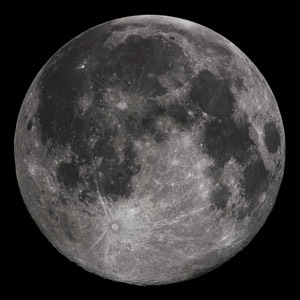 The Moon is a satellite of our planet - Earth, one quarter of its size, and circling us once every 27.3 days. Many planets have smaller bodies orbiting around them, some large like the Moon, some much smaller; chunks of rock, dust or ice (Saturn's rings are made mostly of small pieces of ice). As the Moon circles our planet, it gets lit up by sunlight. When it is nearer the sun most of the side the sun shines on cannot be seen from Earth so we see just a lit up edge (a crescent). 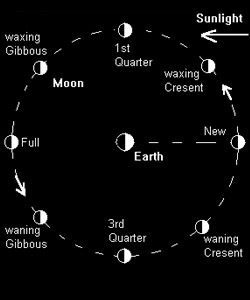 When far from the sun we see the full circle of the Moon illuminated (full moon). No-one knows for sure how the Moon was created. The most popular theory says it is the result of a crash between a body as big as the planet Mars and the Earth, that happened 4.6 billion years ago, about 30-50 million years after the formation of the solar system. Mysteriously, one side of the Moon is never visible from the Earth. In fact, it was not until 1959 when a Russian Space probe called Luna 3 took photographs of the so-called dark side of the Moon, that humans had ever seen it. 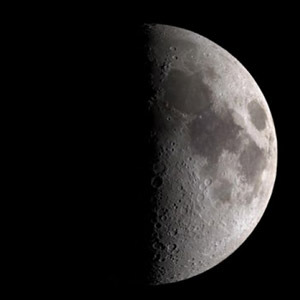 In reality both sides of the Moon get the same amount of sunlight, but the same side always faces the Earth, so the other side appears dark to us. This is because the Moon rotates around its own axis at exactly the same time as it takes for it to orbit the Earth - so the same side of the Moon always faces the Earth. In 1968, the crew of NASA's Apollo 8 mission became the first people to see the dark side of the Moon for themselves, when their spacecraft became the first to fly right around the moon. Google has created a website where you can explore the Moon's surface - click here to start your own Lunar mission. The Moon has influenced the Earth and the people that live here for thousands of years. Although it only generates about 1/6th of the gravity of Earth, the Moon's gravity is still strong enough to attract the waters of our seas from around 250,000 miles distance - the Moon is what makes our ocean's tides. People for thousands of years have formed theories that the Moon has an effect on people and their lives. Cave paintings dating back 15,000 years show primitive man understood the Moon's phases. And Ancient Greeks thought that the Moon could cause madness in individuals. 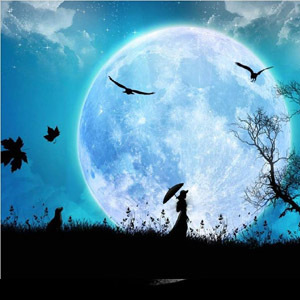 The unpleasant word "lunatic" used to be used to describe people with mental health issues, is derived from the latin word "lunaticus", which means "of the moon" or "moonstruck". Even now the Moon fascinates artists, film-makers and musicians, and the Moon features in many films, songs, literature and art-works. IN 1969, NASA landed two men on the moon - Neil Armstrong and Buzz Aldrin became the first humans ever to set foot on another world. Five more missions landed men on the Moon, the last one in 1972. Twelve astronauts explored the Moon on these missions, gathering rock samples, taking pictures and doing lots of experiments, to learn more about our Earth's nearest neighbour. No-one has been back to the Moon since, though NASA does hope one day to be able to return. 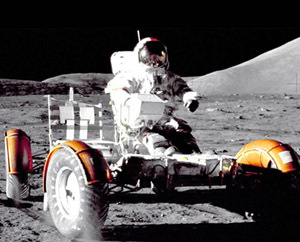 Find out more about NASA's Apollo Moon missions.